This week I have been captivated into mainly working with a new purchase. 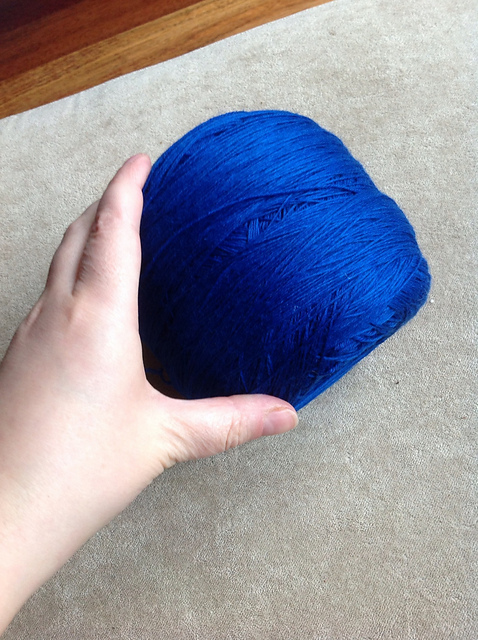 Over the weekend I got a delivery of the biggest skein I've ever owned. This is a lace weight skein that weighs 300g! 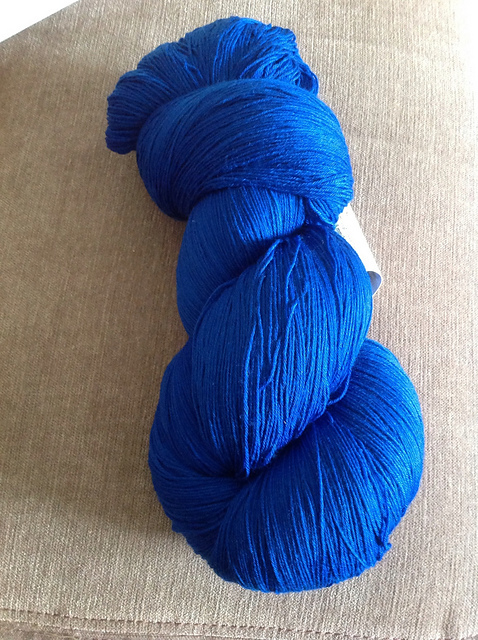 It is also, more importantly, a Wollmeise Lace-Garn skein in the Kornblume colourway. It is around 1590m/1700yds in length and is made up of the squishiest and softest superwash merino imaginable. I can see why people go nuts for it. It was incredibly expensive if you think of it in terms of buying a single skein, but when you convert it into three skeins it becomes much more reasonable in price. One of the problems of having such a huge skein becomes evident when you try to ball it up. I used my regular ball winder until the cake of yarn got too big for the handle to turn without catching the yarn. Then I removed it and wound the rest manually. I could have cut the yarn and wound three cakes but I didn't want to do that when it came as one. It took several hours to wind the whole skein, but I did keep having to take breaks. The resulting cake of yarn is gigantic and I can barely get my hand around it. 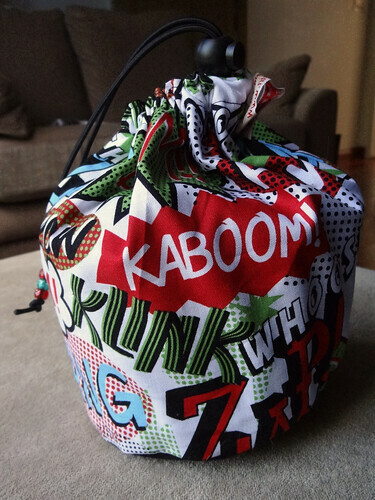 I decided that perfect bag to put this in was, my new one from Nicsknots, my superhero fabric bag. The balled up yarn just fits into the bag. This bag is fabulous and I just had to team it up with this superhero of a cake of yarn. Of course, once I had my yarn already to use and in a bag, I had to find a pattern. Except, I already knew what pattern I was going to use. The pattern was the reason I had decided to splash out and buy such an expensive skein. The pattern is Viajante by Martina Behm, another one of my set of pattern purchases that included Brickless. This pattern is another intriguing one from this designer, with lots of stocking stitch. The resulting item is shawl-like in appearance, except it is made up of two layers, joined in the round. This means you can get inside the shawl and wear it like a cowl. It is incredibly clever and inventive and I know it is something that I would wear a lot. The pattern was originally knit in Wollmeise Lace-Garn and it looked lovely and I couldn't think of another yarn that I wanted to use as much. I stalked the updates and bagged this skein. Even though this colourway wasn't what I thought I was going to buy, it has turned out to be a great choice. The blue is very deep and vivid and is almost impossible to capture on camera by someone who isn't very talented. I adore the colour and the yarn, and I am going to relish knitting this pattern. It's just as well, as it's going to be a mighty endeavour! 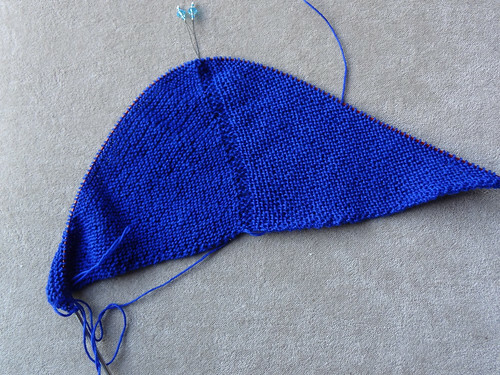 The pattern starts with a garter stitch triangle and then is joined in the round. The garter stitch is very squishy and I am enjoying knitting it. Soon it will be stocking stitch though and then I'll be doing that for eons! This is likely to be a long term project that I can take around to social occasions as it won't require much pattern checking. I hope it gets done faster than the Nuvem!